"I only have a small piece of land, but I have the best spot," he said. "Other people have more land, but when they harvest they don't get as many beans," he added, gesturing toward a noisy pig pen — the source of fertilizer for his rich soil. Thong is one of more than 780 families in Luang Prabang province who have taken to growing Arabica beans for the locally-based company Saffron Coffee. Following increased government eradication efforts, opium cultivation in Laos fell from 26,800 hectares in 1998 to 1,800 hectares in 2005, according to the United Nations Office on Drugs and Crime. But this left many households in Northern Laos without an income. FILE - Two Thai soldiers trim poppies in a Chiang Mai field in December, 1996. Southeast Asia's Golden Triangle, the rugged area where the borders of Burma, Laos and Thailand meet, has provided much of the world's supply of heroin and opium. Highland farmers turned to increased rice or corn cultivation, using a traditional "slash and burn" technique that requires burning vegetation to clear land for crop cultivation. The plot of land may only yield a few harvests, and can take decades to regenerate, while farmers move to another area to repeat the process. Government policy over the past 20 years has sought to restrict this activity, leaving many upland farmers seeking an alternative. "One of the big aims that we have in the Saffron Coffee company is to piggyback the work that has been done by NGOs and government agencies previously, to promote coffee in the northern parts of Laos," said Saffron Assistant Director Derek Smith. "One of the difficulties with those programs is that there is no market provided for that coffee, and that is what Saffron is aiming to do." Tourism is booming in Laos. According to government figures, some 4.68 million travelers visited the land-locked nation in 2015, up from 2.5 million in 2010. In the UNESCO town of the old Royal Capital, Luang Prabang, more than 600,000 tourists took in the sights last year, a 14 percent increase from 2014. According to Smith, whose company sells roasted beans to businesses across Laos and also has its own cafe in Luang Prabang, the demand for locally-grown coffee from hotels and guesthouses across the country cannot keep up with supply. "We are identifying both the need for farmers to grow the coffee and grow them in micro-lots, by selling domestically and then eventually internationally as well," he said. 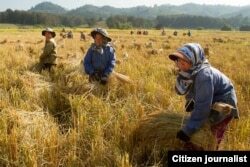 FILE – Rice is harvested in Laos. The government has prohibited "slash and burn" techniques associated with rice farming that they say are harmful to forested areas. But while demand has grown steadily, ensuring supply was not easy in the beginning. There was a need to build up trust in an unfamiliar crop, and an untested company. "The barriers that exist in any model like this comes from needing to work appropriately with provinces, districts and villagers," Smith said. Saffron provides seedlings and know-how to its farmers and agrees to buy all their produce at above market prices to help those with immediate needs benefit from a crop that initially takes three years to bear fruit. "One of the most important things is to try and overcome those barriers, with ways of growing for an individual farmer, without us having to purchase a big plot of land, or a big planation," Smith said. In 2006, the company delivered 300,000 seedlings to farmers, but most ended up dead. "We put the small plants on the truck and drove them to the villages after we knew how many people wanted to grow coffee," recalled Saffron coffee promoter Lat Inphommaly, who educates farmers on growing techniques. "When we gave the plants to the villagers, they just put the plants wherever they wanted them to grow. They did not put them in the right place though, so the plants died," he said. Plants require a balance of shade and sunlight at different stages of growth, Inphommaly explains, something he and four other promoters now spend their days discussing with farmers in order to enhance yields. As the industry matures and the tourists continue to flock, coffee-growing techniques are no longer the major concern for many of Saffron's long-time farmers. “It is not so difficult to grow coffee, because an expert has trained me," said grower Mouy. "I am happy to grow coffee, but now I only have a small piece of land to grow on, if I had more land I would be happier."